The economic evaluation of healthcare interventions requires an assessment of whether the improvement in health outcomes they offer exceeds the improvement in health that would have been possible if the additional resources required had, instead, been made available for other healthcare activities. Therefore, some assessment of these health opportunity costs is required if the best use is to be made of the resources available for healthcare. This paper provides a framework for generating country-specific estimates of cost per disability-adjusted life year (DALY) averted ‘thresholds’ that reflect health opportunity costs. We apply estimated elasticities on mortality, survival, morbidity and a generic measure of health, DALYs, that take account of measures of a country’s infrastructure and changes in donor funding to country-specific data on health expenditure, epidemiology and demographics to determine the likely DALYs averted from a 1% change in expenditure on health. The resulting range of cost per DALY averted ‘threshold’ estimates for each country that represent likely health opportunity costs tend to fall below the range previously suggested by WHO of 1–3× gross domestic product (GDP) per capita. The 1–3× GDP range and many other previous and existing recommendations about which interventions are cost-effective are not based on an empirical assessment of the likely health opportunity costs, and as a consequence, the health effects of changes in health expenditure have tended to be underestimated, and there is a risk that interventions regarded as cost-effective reduce rather than improve health outcomes overall. An effective intervention will only improve health outcomes overall if the additional health benefits it offers exceed the health opportunity costs associated with the additional healthcare costs that it imposes. The criteria commonly used to judge cost-effectiveness (ie, cost per disability-adjusted life year (DALY) averted ‘thresholds’) do not reflect evidence of health opportunity costs with the result that decisions and recommendations based on them may reduce rather than improve overall population health. Available estimates of the health effect of changes in health expenditure using country-level data can be used to inform country-specific assessments of health opportunity costs by applying estimated mortality effects (elasticities) to country-specific data on baseline epidemiology, demographics and health expenditure. A range of plausible estimates of the cost per DALY averted from changes in health expenditure are reported for 97 low-income and middle-income countries. The reported estimates are an evidence-based improvement on the type of norms that have become widely cited and used as ‘thresholds’ to judge cost-effectiveness, and this framework of analysis can be applied to the results of any study thought to identify plausible effects on mortality of changes in health expenditure, whether they are based on country-level or within country data. Evidence of the expected costs and health effects of making a healthcare intervention available to specific populations in a particular setting and healthcare system (HCS) are typically summarised as incremental cost-effectiveness ratios, which are often expressed as the cost per quality-adjusted life year (QALY) gained or the cost per disability-adjusted life year (DALY) averted.1 These measures provide a useful summary of how much additional resource is required to achieve a measured improvement in health (the additional cost required to gain one QALY or to avert one DALY). Whether the cost per QALY gained or DALY averted offered by an intervention is judged to be cost-effective requires some explicit or implicit criteria, often referred to as a cost-effectiveness (cost per DALY averted) ‘threshold’ below which the intervention is regarded as worthwhile. However, an effective intervention will only improve health outcomes overall (ie, produce a positive net health benefit) if the additional health benefits it offers exceed the health opportunity costs associated with the healthcare costs that it imposes (whether these must be found from existing commitments or additional expenditure that could have been devoted to other healthcare activities). Therefore, an assessment of health opportunity cost indicates the maximum an HCS can afford to pay for the health benefits that an intervention offers without reducing health outcomes overall. It also reflects the value (the health benefits) of increasing healthcare expenditure. Estimates of the marginal productivity of health expenditure in producing health (QALYs) are becoming available for some high-income countries based on approaches to estimation that exploit within-country data.13–16 This evidence from national HCS in high-income countries gives some indication of possible values in other contexts based on estimates of the income elasticity of demand for health and assumptions about the relative underfunding of HCS (ie, the shadow price for public expenditure on health).17 However, there are estimates of the mortality effects of changes in healthcare expenditure based on country-level data (typically expressed as elasticities) which, in combination with country-specific data on baseline epidemiology, demographics and health expenditure, offer the opportunity to estimate country-specific cost per DALY averted ‘thresholds’ that reflect evidence of health opportunity costs. The Bokhari et al model specification applies an instrumental variable approach to cross-sectional data from the year 2000 for 127 countries and models both public expenditure on health and a country’s GDP as endogenous variables (both in per capita terms). Their identification strategy employs as instrumental variables: consumption–investment ratio, military expenditure per capita of neighbouring countries and measures of institutional quality.23 Bokhari et al make the case that the consumption–investment ratio is related to the level of GDP, but not directly to health outcomes, making it a suitable instrumental variable for GDP. Similarly, they argue that military expenditure in neighbouring countries is a reasonable instrument for public expenditure on health because it is not directly related to health outcomes, and it encourages domestic military expenditure that crowds out other public expenditure, including health. Finally, they argue that GDP and public expenditure on health are related to the institutional quality instruments that reflect economic management and policies for social inclusion and equity, respectively. These are typical instrumental variables following in the tradition of earlier papers and pass the standard tests for relevance and validity.24 In addition, Bokhari et al allow for the outcome elasticity with respect to expenditure of countries to vary by two variables reflecting the level of infrastructure and shock in donor funding. The results from this approach to estimation using cross-country data can inform country-specific cost per DALY averted values by applying estimated elasticities to country-specific mortality rates, conditional life expectancies (CLEs) and population distribution (all by age and gender) as well as estimates of disability burden of disease and total healthcare expenditure. We use the Bokhari et al model specification and expand on their original dataset for year 2000 (ie, under-5 mortality and the original instrumental variables, including bespoke data on institutional quality) to re-estimate the effect of changes in expenditure on adult male and adult female mortality from the World Bank, enabling greater coverage of the population, as well as: (1) a measure of the survival burden of disease: years of life lost (YLLs); (2) a measure of the morbidity burden of disease: years of life disabled (YLDs); and (3) DALYs, a generic measure of overall ill health, from the Global Burden of Disease (GBD) database.25 Elasticities are calculated at the country level and differ only with respect to the interaction of measures of infrastructure and donor funding. While data from 2000 is used, there is little evidence to suggest elasticities would be expected to vary over time.18 The estimated elasticities for low-income and middle-income coutries (LMICs) (see table 1) are applied to country-specific data from 2015 on health expenditure, epidemiology and demographics. There are four ways in which the estimated elasticities in table 1 can be used to estimate the likely DALYs averted as a consequence of a 1% change in health expenditure in each country, i. These are summarised in table 2 and are briefly described below, with details of the data used reported in online supplementary file 2.
, can be applied to the number of deaths observed in this age group in each country to provide an estimate of the number of under-5 deaths averted as a consequence of a 1% change in country health expenditure. Similarly, the estimated elasticities for male and female adults (ages 15–60 years) are applied to observed deaths by age and gender in each country, that is, assuming that the proportionate effect on mortality applies equally across age groups within 15–60 years age range. Once the likely deaths averted by a 1% change in health expenditure have been estimated (see Eqs. (1) and (2)), the survival effects can be established by applying CLE at age of death to each death averted within each age group for which deaths averted have been estimated (see Eq. (3)) and scaling these survival effects to be for the whole population using data on the population level YLL burden (see Eq. (4)). This assumes that the survival effects of changes expenditure are in proportion to the survival burden of disease in each age group. Changes in expenditure that affect mortality and survival are also likely to have an effect on morbidity through the prevention and treatment of disease (ie, a direct effect decreasing YLD burden). However, an indirect effect may also be present as reductions in mortality and the resulting increased survival is likely to increase the number of years during which morbidity is experienced. The total DALYs averted due to a 1% change in health expenditure in each country is the sum of the survival effects (the YLL averted in Eq. (4), A in table 2) and the net morbidity effects (YLD averted in Eq. (5), B minus C in table 2). This illustrates how estimates of mortality effects of health expenditure, in the form of elasticities, can be used to provide an indication of the likely survival and morbidity effects. The health effects of a 1% change in country health expenditure will differ by country due to differences in the number observed deaths by age and gender and differences in age-specific and gender-specific CLE as well as elasticities. The amount of expenditure required to avert one DALY will also differ by country due to differences in total health expenditure. Nonetheless, a key assumption has been required, which is that the estimated mortality and survival effects of changes in health expenditure are a good surrogate for the morbidity effects. , which are calculated from observed mortality and CLE by age and gender. Therefore, YLLs averted due to a 1% change in health expenditure can be directly estimated (Eq. 7) rather than applying CLE to estimates of deaths averted by age and gender (as required in Eqs. (1) to (4) above). The possible direct and indirect effects on morbidity of changes in health expenditure that affects survival can be calculated in the same way as previously; assuming that that the estimated effects on survival can be used as a surrogate for likely effects on morbidity and with the indirect effect of increases in morbidity based on directly estimated survival effects. Therefore, the net morbidity effects are calculated in the same way as in Eq. (5) but with directly estimated YLLi averted replacing mortality based YLLi averted (E minus C in table 2). DALY 3 uses direct estimates of the effect on survival burden in the same way as DALY 2 but combines these with direct estimates of the effect on morbidity. The total DALYs averted due to a 1% change in health expenditure in each country is the sum of the directly estimated survival effects (YLL averted in Eq. (7), D in table 2) and the directly estimated morbidity effects (YLD averted in Eq. (8), F in table 2). These four alternative ways to estimate health opportunity costs, as measured by the cost per DALY averted, make slightly different assumptions. The comparison of DALY 1 with DALY 4 gives some indication of whether it is reasonable to use estimates of the mortality effect of changes in health expenditure as a surrogate for likely survival and morbidity effects. This finding is itself useful for studies with estimated elasticities for mortality outcomes but requiring additional information about the effect of expenditure on other health outcomes. In particular, studies investigating the relationship between mortality and health expenditure using high-quality within-country data (typically undertaken in high-income countries), which overcomes some of the difficulties and challenges of estimation based on aggregate country-level data. The extended Bokhari et al model generated country-specific elasticity results for all of the countries in the model, where the elasticities differed due to the specification of the relationship of expenditure with health. The average and range of elasticities for each of the six measures of health outcome are reported in table 1. Estimated elasticities differ due to the presence of interaction terms combining spending and level of infrastructure (proxied by ‘paved roads per unit of area’) and the absolute deviation in donor funding from the historical mean. The direction and size of the difference in elasticities between countries depends on the signs of the estimated coefficients on the interaction terms and relative magnitude of each of these. The estimates of cost per DALY averted for each country are reported in online supplementary file 1 where they are also expressed as % of GDP per capita. Few countries have any estimates that are higher than 1× GDP per capita and none are higher than 3× GDP per capita. 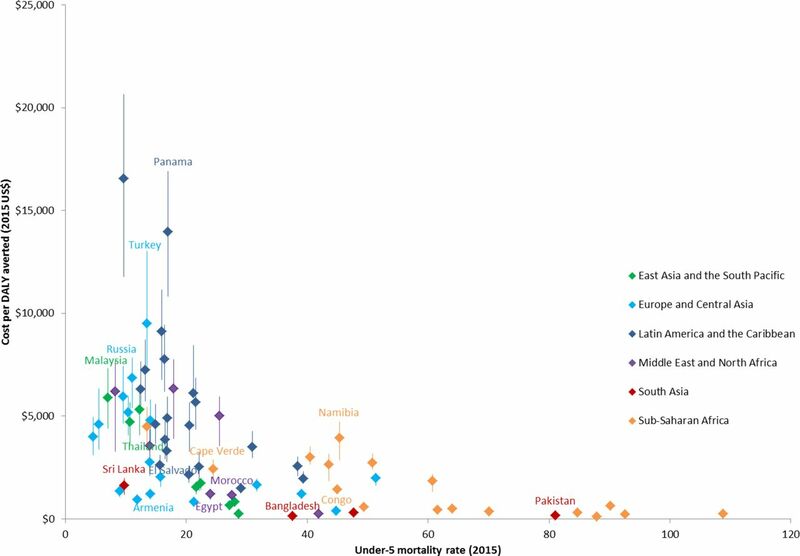 Among those with any estimate higher than 1× GDP per capita, all are middle-income countries with slightly lower average mortality, survival and ill health burdens than LMICs on average. In almost all cases, DALY 2 provides the lowest cost per DALY averted estimate for each country. This reflects the fact that the estimated elasticity for survival effects (YLL) is typically greater than for morbidity effects (YLD) and effects on DALYs. This larger effect on survival is then used as a surrogate for morbidity effects when estimating DALY 2. Although the differences in the elasticities reported in table 1 might indicate that employing this ‘surrogacy’ assumption risks overestimating morbidity effects, this should not be overinterpreted as the estimated elasticities are not based on within-country data but country-level data. However, in general, the comparison of DALY 1 and DALY 4, which are found to be relatively similar compared with comparing DALY 2 and DALY 3, does suggest that using estimates of the mortality effect of changes in health expenditure as a surrogate for both likely survival and morbidity effects may not be unreasonable although with additional uncertainty. 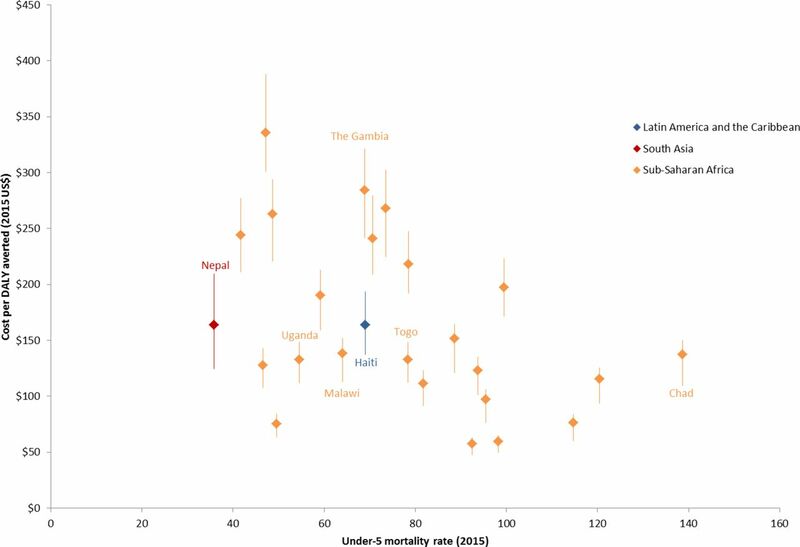 Figures 1 and 2 illustrate the range of estimates for each low-income country and middle-income country by under-5 mortality rate, respectively. The average of the range of values for each country is not the average for the four cost per DALY averted ratios but the ratio of a 1% change in expenditure to the average DALYs averted across these four estimates. A pattern is evident between mortality rate and cost per DALY averted. While the low under-5 mortality in Haiti would, other things equal tend to increase the cost per DALY averted; it is higher in The Gambia than in Haiti, which has the same under-5 mortality rate, primarily because The Gambia has higher government expenditure on health. This is also illustrated by Panama and El Salvador as well as Congo and Namibia. Cost per DALY averted by under-5 mortality rate for low-income countries. DALY, disability-adjusted life year. Cost per DALY averted by under-5 mortality rate for middle-income countries. DALY, disability-adjusted life year. Figure 3 illustrates the same cost per DALY averted estimates but now by per capita government expenditure on health. It suggests that the cost per DALY averted increases with per capita health expenditure which is, in general, what might be expected, although this is to some extent inevitable given the methods used to generate these estimates. It also illustrates the similarity in the range of estimates for most countries but also why others differ. For example, although Russia has nearly double the per capita government expenditure on health of Malaysia and has a similar under-5 mortality rate (see figure 2), it has higher baseline adult mortality as well as YLD, YLL and DALY burden than Malaysia and therefore a lower cost per DALY averted range than might otherwise be expected. Cost per DALY averted by per capita government expenditure on health for LMICs. DALY, disability-adjusted life year. However, although Cape Verde and Congo have very similar per capita expenditure on health, our range of estimates of cost per DALY averted for Cape Verde is $1938–$2843 compared with $1235–$1613 in Congo. Part of the difference is due to the baseline mortality rates in Congo, which are more than double those in Cape Verde. Both countries also differ in terms of the age and gender structures of the population, with Congo having a higher per cent of the population in the under-5 age group. These factors all contribute to the differences in cost per DALY averted between the two countries and are relevant to cost per DALY averted for all countries. 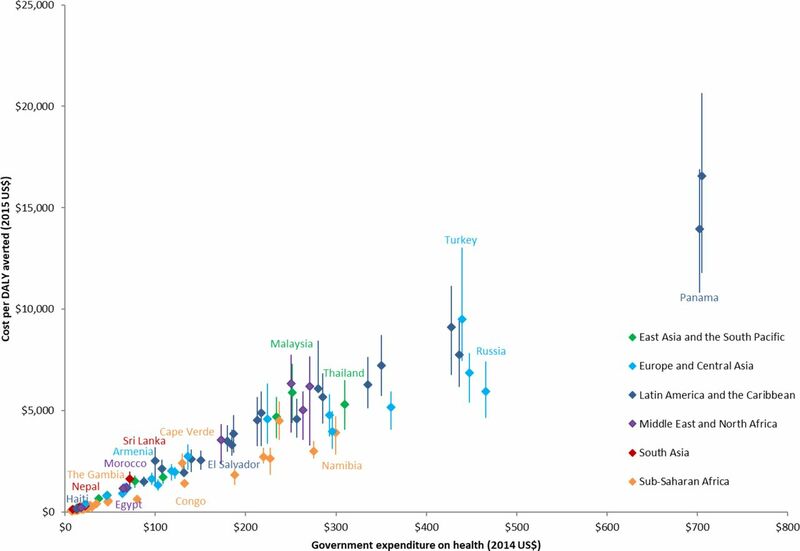 The apparent similarity in the range of cost per DALY averted between countries should not be overinterpreted as estimates would also be expected to differ if countries are able to generate health at different rates, which would be reflected in differing elasticities. The ranges of estimated elasticities for each country vary little, reflecting the limited economic significance of the estimated coefficients on the interaction terms. This underscores the importance of further research using within-country data to estimate these values at a country level and to account for the heterogeneity between different HCS. Estimates of the health opportunity costs of healthcare expenditure are critical for informing assessments of whether the improvement in health outcomes offered by investing additional resources in a new intervention exceeds the improvement in health that would have been possible if the additional resources required had, instead, been made available for other healthcare activities. Commonly established implied norms, such as 1–3× GDP per capita, are often inappropriately applied in practice to judge cost-effectiveness.5 28 Such values generally reflect norms or the social demand for health (ie, a view of what value ought to be placed on improvements in health) rather than an evidence-based assessment of health opportunity costs given actual levels of expenditure.29 As such, they do not reflect the health that the HCS is currently able to deliver with the resources available, that is, the ‘supply side’ of the HCS. Adopting ‘thresholds’ to judge cost-effectiveness that are too high and do not reflect the ‘supply side’ will lead to decisions that reduce overall health because the health gained from adopting an intervention will be more than offset by the health opportunity costs elsewhere in the HCS. As well as leading to net harms for population health, it may also exacerbate health inequalities and unwarranted variations in access to other healthcare, depending on where the health opportunity costs of additional healthcare costs tend to fall. The framework of analysis set out in this report illustrates how estimates of the relationship between mortality and variations in healthcare expenditure can be employed alongside country-specific data on demography, epidemiological profile and expenditure to inform estimates of health opportunity costs. While data are readily available for the latter, reliable estimates of the relationship between mortality and variations in healthcare expenditure present a challenge. The ranges estimated here are consistent with the ranges of implied cost per QALY gained for countries based on the analysis in Woods et al, which extrapolates the UK findings based on estimates of the income elasticity of demand for health and assumptions about the relative underfunding of HCS (ie, the shadow price for public expenditure on health). An assessment that elasticities using within-country data are likely to be higher than those based on country-level data is plausible and tends to be supported by growing literature from other countries, in particular the studies set in the UK and Australia contexts discussed above. Nonetheless, further research to provide elasticity estimates using within-country and within-state or province data where applicable would be welcome. Few LMICs are likely to have access to the type of within-country data that could be used to directly estimate their cost per DALY averted. This paper demonstrates that it is possible to generate country-specific estimates by applying elasticities estimated from cross-country data to country-specific baseline data. This offers country-specific approximations based on an underlying international health production function. Nevertheless, the resulting range of country-specific estimates are more likely to indicate the scale of health opportunity costs than previously applied norms that have become widely cited. Therefore, they could be used as interim guidance while research on within-country research is developed. In doing so, it should be noted that where budgets for health are devolved to states or provinces and where there are differences in demography and epidemiology, there are also likely to be differences in health opportunity costs by geography within a country. The more fundamental contribution of this paper is to clarify the often confused concept of a ‘threshold’ by demonstrating that judgements about cost-effectiveness can be informed by an empirical assessment of the likely health opportunity costs faced, given existing levels of health expenditure. The demonstration of the type of empirical analysis that can support this assessment also makes this concept a real and practical way to help inform better decision making in LMICs and influence how supranational bodies make recommendations and set priorities, including purchasing and investment decisions. These continuing research efforts start to identify the real value of devoting more resources to healthcare and can contribute to greater accountability for the healthcare and other expenditure decisions made at a local, national and supranational levels. , 2014. Using cost-effectiveness thresholds to determine value for money in low- and middle-income country healthcare systems: are current international norms fit for purpose? York. https://www.york.ac.uk/media/che/documents/papers/researchpapers/CHERP98_costeffectiveness_thresholds_value_low_middle_income_countries.pdf (accessed 27 Nov 2015). , 2016. Use and misuse of thresholds cost–effectiveness thresholds: pros and cons. Bull world health organ. http://www.who.int/bulletin/online_first/en/ (accessed 6 Oct 2016).
. First report of the health committee 2007-2008. London, 2008.
, 2016. Estimating a Cost-effectiveness threshold for the Spanish NHS. Madrid. http://documentos.fedea.net/pubs/eee/eee2016-22.pdf. (accessed 31 Jul 2017). , 2016. Assessing the impact of health care expenditures on mortality using cross-country data. York. https://www.york.ac.uk/media/che/documents/papers/researchpapers/CHERP128_health_care_expenditures_mortality_cross-country_data.pdf (accessed 3 May 2017). , 2018. Global Burden of Disease Study 2015 (GBD 2015) Data Resources | GHDx. http://ghdx.healthdata.org/gbd-2015. (accessed 21 Mar 2018). , 2017. Estimating Expected Health Opportunity Costs in the NHS (Analysis of 2012/13 Expenditure Data). York. https://www.york.ac.uk/media/che/documents/Estimating_expected_health_opportunity_costs_in_the_NHS_201213.pdf (accessed 23 Jan 2018).
. Disease control priorities: improving health and reducing poverty. Washington D.C: World Bank, 2018. Contributors All authors contributed to the concept and design of this paper. JO led on the analysis and drafting, and the final paper was edited and approved by all authors. Funding This study was funded by http://dx.doi.org/10.13039/100000865Bill and Melinda Gates Foundation (Grant Number: OPP1165566).